How to Run Apple Search Ads Discovery Campaigns? There’s an enormous ocean of keywords out there, and chances are that you miss some valuable fish. But what is the reason to catch it? If you are not in the habit of revising your list of keywords from time to time, you bring your Apple Search Ads account to a standstill. And that means you definitely generate less revenue than you could. Because you know how it all works: more relevant keywords added result in more relevant traffic; more relevant traffic means more potential conversions, and conversions eventually bring in revenue. This is the rationale behind keyword expansion. There are different approaches that user acquisitions managers adopt to search and add extra relevant keywords. Here, we’ll dwell on the most straightforward one – building discovery campaigns. 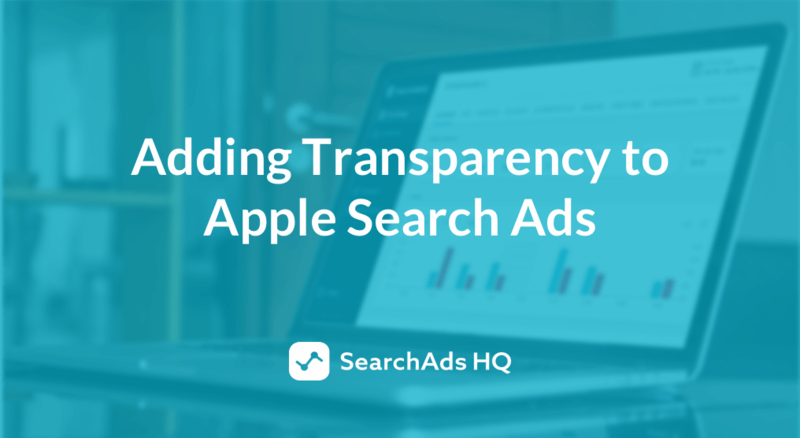 What are Apple Search Ads discovery campaigns? The key purpose of an Apple Search Ads discovery campaign is to identify relevant terms, long-tail keywords, synonyms, misspellings, etc., that combine all the three requirements above, using match types with the widest reach – Search Match and Broad Match. They help generate new keywords ideas and reveal top performers to be transferred to Exact campaigns with higher bids. 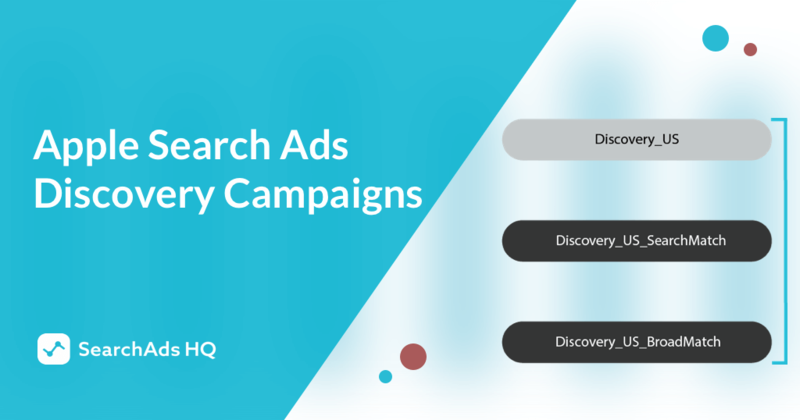 In the picture below you can see how it works: keywords generated in a Discovery campaign are added to the Brand, Generic and Competitors campaigns as exact match keywords. Broad match is a default Search Ads match type, the prime purpose of which is to match your ads to relevant search terms such as partial or close words, long variants, synonyms or related search terms. 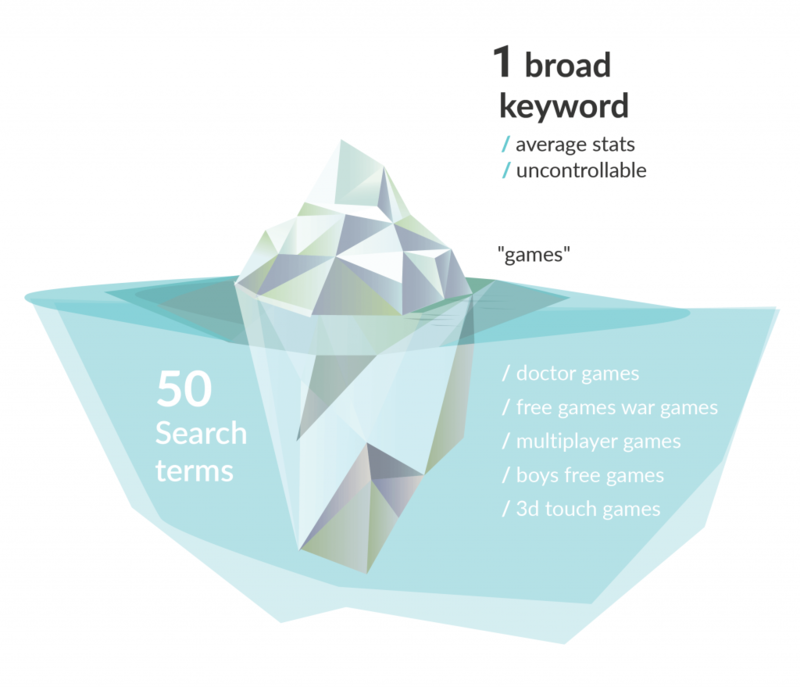 Think of it as an iceberg: if you create a group with several broad match keywords and set a small budget, you can generate hundreds of related search terms. Just what we need! 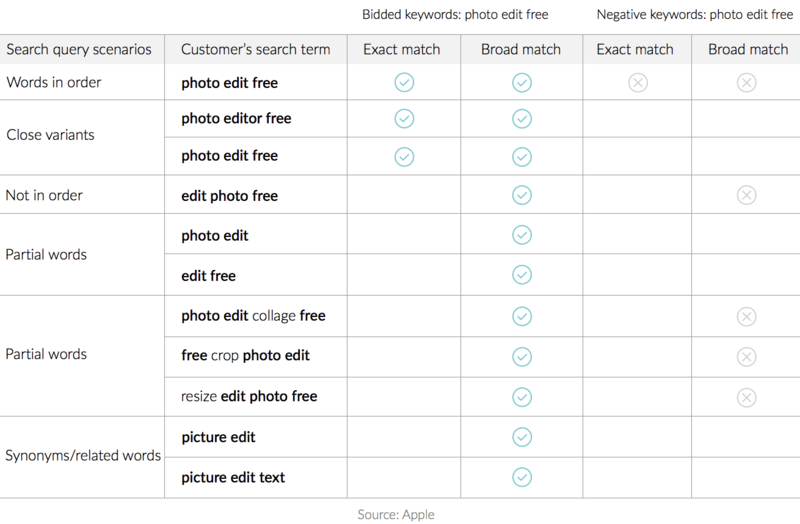 And most importantly, these keywords will have a high relevance score, which is vital to Apple Search Ads. After your campaign has run for a while, you can dive into the search terms report and search for great keyword ideas. 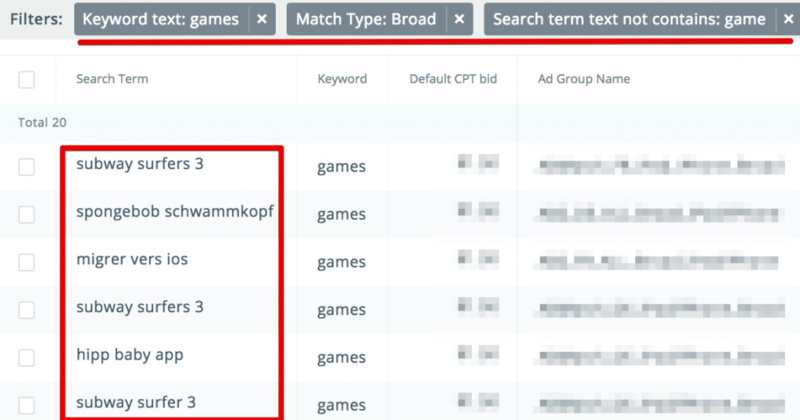 Below you can see a search terms report for a broad match keyword “games”. On purpose, we’ve selected the search terms without the word “game”. In other words, these are related (new root) keywords. 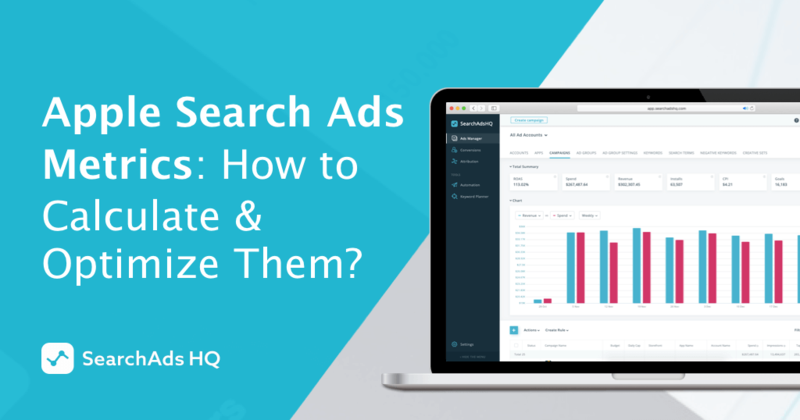 Search Match automatically matches your ad to relevant search terms without you having to identify and actively bid on keywords. It relies on multiple resources, including your App Store page metadata, the information on similar apps in the same genre, and other search data. The basic idea of Search Match is similar to that of the broad match technique, but it doesn’t require to specify the list of keywords. The method helps discover keywords that could be missed, for example, search queries for competitors’ apps or even localized keywords. Search Match can be wildcard, as you never know what exactly it will come up with. Thus, the most effective way to increase your traffic volume is to gradually add new relevant keywords to your ad account. Below you can find a 6-step keyword expansion algorithm. In order to mine keywords, you have to create a separate discovery campaign for each storefront and set a comfortable budget to spend on searching new keywords. Obviously, the bigger the budget, the faster you will find more high-performing keywords. On the other hand, there’s no point in cutting the budget severely, as you may miss the potential profit that the discovered keywords can bring. A good idea is to apply the 20/80 rule, i.e. allocate 20% of your budget for the discovery campaign. Since the main purpose of a discovery campaign is to generate as many search terms as possible, there is no much point in breaking it into targeting groups. This will only produce low volume terms and make management more complicated. Create a separate Discovery campaign for each storefront and set a comfortable budget. Create a Search Match ad group without keywords and with Search Match enabled, and set your bid at the ad group level. Within the same campaign, create a separate Broad Match ad group with broad match keywords and with Search Match disabled. If you already have a list of exact match keywords, add them to the broad match group as broad match keywords. This will speed up the process. 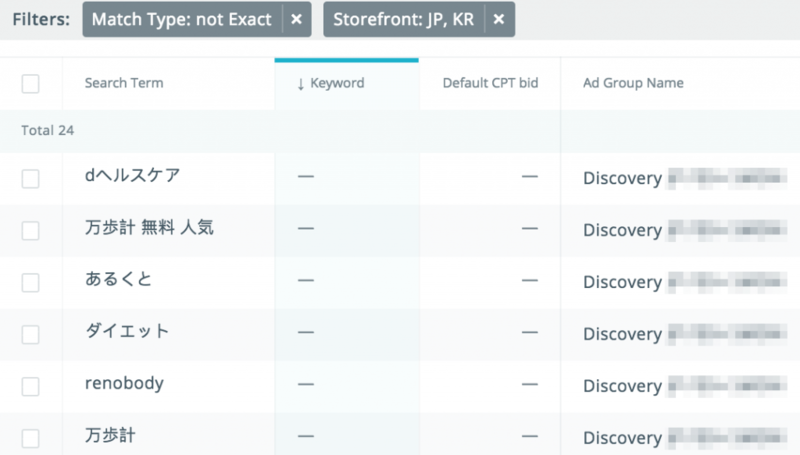 To avoid competition for impressions, all keywords from your broad match campaign should be added as negative exact match keywords to the discovery campaign. To avoid competition for impressions, all keywords in exact match groups should be added to the discovery campaign as negative exact match keywords. Give your campaign a couple of weeks to run. This will guarantee that you collect sufficient data to analyze new search terms that Apple Search Ads matches to your ads. Go to the “SEARCH TERMS” tab and set a 14-day timeframe. The best way is to analyze search terms every week or fortnight. Arrange the search terms (STs) into 3 groups — Good search terms, Bad search terms and Insufficient data — and work with them as shown in the chart below. Good STs are relevant high-performing search terms which make the traffic grow without hurting its quality. All the steps above lead to discovering these queries. Good STs should be moved to the exact match keywords group. 1) Add the winning search term to the exact match group. Depending on your account structure, there can be several exact groups where you need to move this keyword. 2) Add the winning query as an exact negative keyword to your discovery campaign, just the way you did in Step 1. 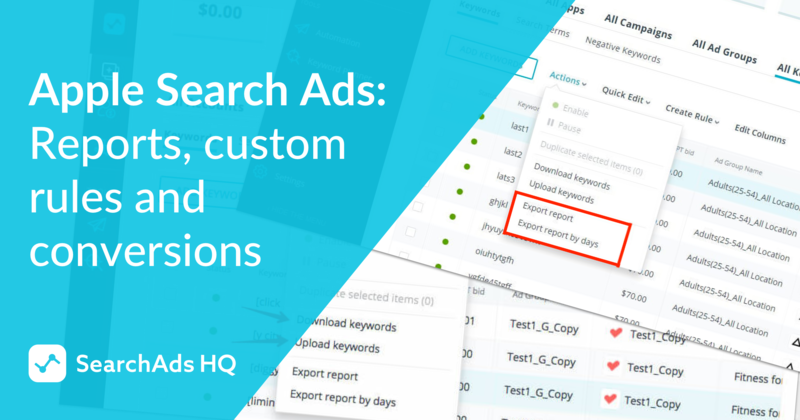 This keyword is included in the exact match group, so you have to make sure that Search Ads doesn’t match ads to this search term in your discovery campaign. Negative exact match excludes your ad for searches of the exact keyword phrase, but it may still show for searches that include related and long/short keyword versions. That’s why it’s reasonable to add close variants (e.g. “game” and “games”) and misspellings to negatives as well. Once you’ve discovered such search terms, add them to your discovery campaign as negative exact keywords. There are no conversions and your spend threshold hasn’t been reached yet. For example, the search terms have spent less than 3 x Target CPA and haven’t brought any downloads yet (e.g. Download = 0 and Spend < $15). Low volume term. The data you request may be below Apple’s privacy threshold. For example, search terms must reach at least 10 impressions, otherwise the “low volume” value appears in your search terms report. Age, location or gender reports require minimum 100 impressions before Search Ads can show any values. If you report has returned the “low volume” value, give the data some time to accumulate or extend the date range up to 30/60/90 days to get more data. Take steps 2-5 every week or fortnight and use the data from the latest review up to the present moment. By following these recommendations step-by-step, you can gradually increase the number of relevant keywords and, as a result, boost your traffic volume. Naturally, the traffic volume in discovery ad groups will start dropping in a while. It has to do with exact negative keywords which are regularly being added to discovery ad groups. To keep mining new relevant keywords, you can gradually increase the CPT bid in discovery ad groups in order to make it into the auction with more expensive keywords. Discovery campaigns also help find negative keywords. Apple Search Ads has a limitation on the number of keywords in a group; this can be a problem for large accounts, but in practice, everything usually works well. Keyword expansion is a technique which has various implementations. In addition to discovery campaigns, there are other approaches that address the same issue – generating valuable keyword ideas – but are based on other actions.